Yesterday was Day 88 in this journey, I bring it up for no particular reason. I was in Little Rock, Arkansas to watch the Arkansas Travelers take on the NW Arkansas Naturals. I got into Little Rock the night before from Memphis, I spent a lot of time at a Starbucks the previous night and then yesterday since it was a 7 pm start. It rained on and off with the threat of rain all day. I was hoping there wouldn’t be any weather delays and that the game didn’t go to extra innings. I had to be in Oklahoma City by 10 am for a radio interview and that was a 5 hour drive. Well, the game went to extra innings with the Naturals finally put the Travelers away in the 12th and won 6-5! The game ended about 11:15 pm and it started raining immediately after. I drove towards Oklahoma City for 3 hours, found a rest area slept until 8 and made it to the interview by 10:10 am. More about that tomorrow! I have not been writing a lot lately, I feel I have been in a “funk”. I am still enjoying the trip and seeing all the places but I am a little disillusioned with a lot of the minor league venues. I know that minor league baseball is a business and they need to make money to stay in business. Most are using a formula of entertainment that “seems” to work for their community. I alluded to some of this yesterday. The food seems to be the same everywhere, the constant entertainment between innings, etc. I don’t know what I expected but I guess I wanted to see something different wherever I went. I have found it’s not necessarily the case. I make no bones about it, I love nostalgia – give me the unique and the old stadiums. I loved McKechnie Park in Bradenton (Pirates), Wrigley Field has a great energy and look, Bakersfield is a real treat, the Montgomery Biscuits utilized the old with new. However, for the most part, a lot of these newer places are “cookie cutter” with the baseball entertainment complex in mind. I have stuck to a schedule and have planned the trip out two to three weeks in advance. This is great to get media attention, I really enjoy it. Even though, the “exposure” has limited me. Part of what I want to do is to get to the smaller communities and get off the beaten path. I want to go to a game every day, but I think come summer, I am going to leave weekends open without scheduled games. This way I can search the back roads, go to the community “Merchant” league games, take in a youth tournament, etc. When I had a conversation with Chris Dearing in South Carolina he told me about a “Black” league that is still played in the South. He felt it is great baseball that people don’t know about. I want to go to those games, search out those venues. I don’t know what I am looking for but I have gotten my fill of the “systematic” formula of baseball entertainment. I understand why it works for the casual fan. I am working my way back to Wisconsin and will be there by the end of the month. It will be nice to see my daughter and my family. My plan from there is searching out great baseball cities in Wisconsin and Minnesota, talking with people who show up on Sunday afternoons to watch the Legion team. I hope these games still exist! Feels great getting a ball! 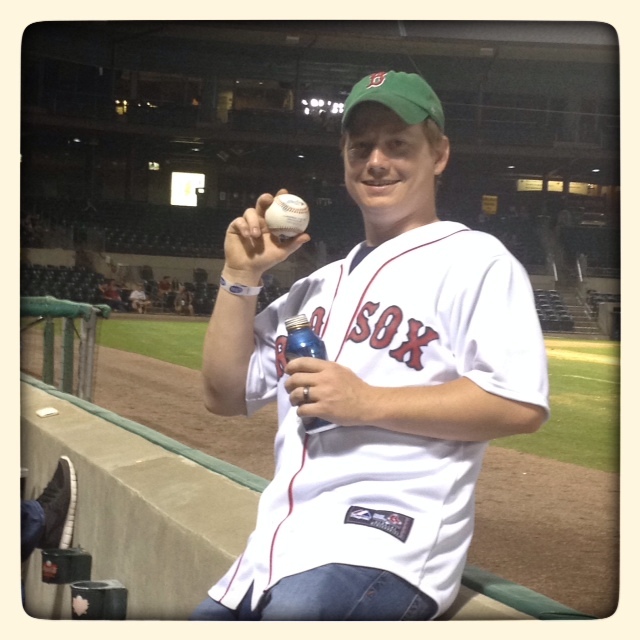 My final thought for the day, at the game last night I got a foul ball. There is something that excites me when this happens. I have been trying to get one at all the different “leagues”, so far I have been successful. The little kid comes out when I chase after and get one. I wasn’t the only one. I sat next to a guy and his friends who wanted one, also. He purchased his tickets so he in a good position to get one. I got the only one that came our way. Unfortunately, I fell through a gate and on to the field to get it. I showed him and his friends the ball then explained to them what I was doing. They loved it, like most people I tell. I was hoping another ball would come our way so he could get one. One didn’t, but when he went to the bathroom a ball was hit near there, I was hoping he was paying attention. He was and out hustled his buddy to get it, and like all “kids”, he was excited to show it off when he got back. I was happy for him! That is what I love about this game, it brings out the “kid” in all of us! American Legion games are alive and well in Wisconsin and across the USA.